San Jose is the tenth largest city in the U.S. (by population), with more people than San Francisco; the city achieves this statistical feat by encompassing 180 square miles. Such a large and populous city surely deserves top-notch rail transit. BART is widely viewed as top-notch rail transit, which is why the city and VTA (Santa Clara County's transportation authority) have made extending BART through San Jose their very top priority. So overwhelming is the priority for BART that VTA re-programmed the revenue from a half-cent transit sales tax (Measure A) passed back in 2000 primarily to the BART extension, breaking a promise made to voters that a significant portion would fund Caltrain electrification. 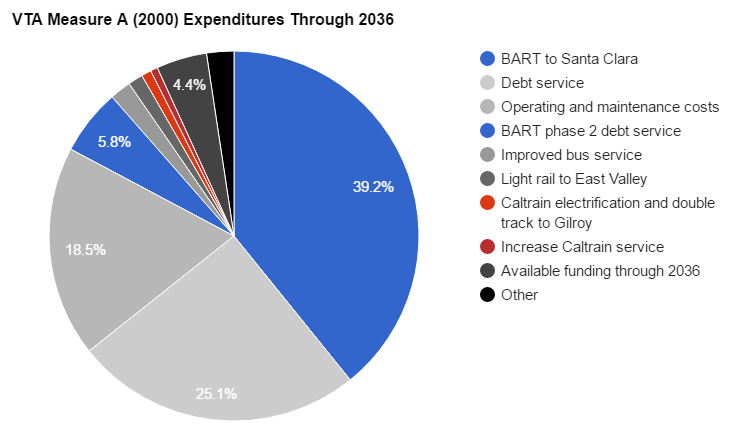 The actual expenditures through 2015 are shown in the diagram at left; money spent on the BART extension is shown in blue, and money spent on Caltrain in red. As can be readily observed, the Measure A money is nearly gone, and the BART tunnel through San Jose is not even started. That's why another half-cent transportation sales tax Measure B was passed in Santa Clara County in November 2016 to raise a further $6 billion through the year 2047. Exactly like 2000 Measure A, 2016 Measure B promises lots of funding for Caltrain, an ample 16% slice that includes grade separations ($700M) and capacity improvements ($314M). The small print, however, allows the VTA board to re-program the funding as it sees fit, adapting spending to "unforeseen" circumstances such as, perish the thought, an over-budget BART extension. With San Jose and VTA suffering from a severe case of BART tunnel vision, it's important to take a more holistic view of what it means to provide the residents and workers of San Jose with a top-notch rail transit network. 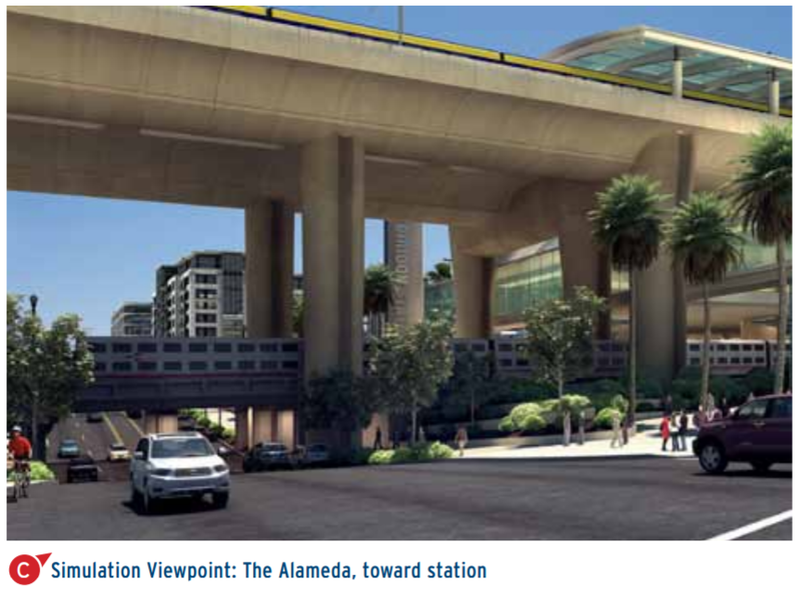 San José Diridon Station will be the best connected transportation hub on the West Coast with the convergence of virtually every mode of public transportation. Activity will increase dramatically with the addition of high speed rail and the extension of Bay Area Rapid Transit (BART) to Diridon station, combined with significant growth by current intercity rail, commuter rail, light rail and bus operators. These new services and growth in demand will create the need for a significant expansion of the existing station. Caltrain, ACE and Amtrak will continue to operate Diridon station as a terminus, where out of service trains are parked for extended layover periods, wasting valuable platform space as train storage. As a result, high-speed rail will not fit within the ground-level footprint of the station, and will most likely require an entirely new elevated facility built over the existing station. These two assumptions are firmly rooted in the ambitious plans of numerous rail transit agencies that prefer to avoid stepping on each other's toes. 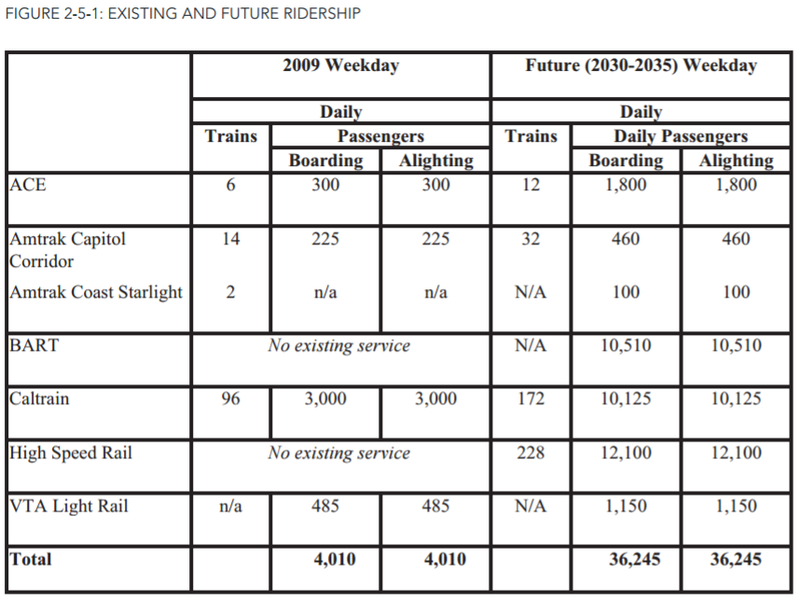 Each agency specifies its future needs, San Jose consultants unquestioningly tally up the numbers (see figure at right), and end up prescribing a framework that demands a massive station complex to support a nearly ten-fold increase in ridership over the next twenty years. Caltrain and high-speed rail consultants have conducted a sophisticated simulation study known as an "operational conflict analysis" that predicted an intolerable traffic jam, with peak-hour delays of nearly an hour. 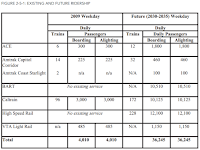 The Diridon Station Area Plan and the Caltrain / HSR operational analyses are flawed for having failed to examine and question the assumptions on which they are built. Yes, the station has enormous potential to become a thriving transportation hub, but that is precisely what makes it a very bad place to park out of service trains. Parking or laying over trains at a station platform is the railroad equivalent of parking an empty truck in the middle of a bustling loading zone, and then concluding that the loading zone fails to function adequately and must be expanded. Trains need to hustle in and hustle out without occupying enormously valuable platform tracks. As will become clear, the simple practice of not parking trains in the worst place to park trains enables a far more efficient and affordable at-grade station configuration for San Jose that provides the same great network effect and transportation benefits for the heart of Silicon Valley, saving enormous sums that can be re-invested to achieve a much better outcome for riders and taxpayers. overlaid with Caltrain service levels for April 2017. Viewed as a line on a map, Caltrain already runs through San Jose and beyond, with Gilroy service having started back in 1992. San Jose Diridon station (served by 92 trains/weekday) isn't a natural terminus; south of it, there are three additional stops located within San Jose city limits: Tamien (dropping from 40 to 34 trains/weekday in April 2017), Capitol (6 trains/weekday) and Blossom Hill (6 trains/weekday). Service between Diridon and Tamien is timetabled at 7 minutes, which makes for an average speed of 15 mph, and average speeds south of there hover around 30 mph. The abysmal service south of Diridon station lacks two important attributes of top-notch rail transit: speed and frequency. That's why it's fair to say that despite that line on the map, Caltrain has yet to be extended through San Jose. It's time to do it properly. One challenge is jurisdictional, with Union Pacific owning the tracks south of milepost 52 and VTA currently holding the rights for only ten daily round trips. However, UPRR does not make intensive use of these tracks, and as a profit-making enterprise would likely be receptive to an outright transfer of ownership while retaining trackage rights to continue operating its Coast Subdivision freight service as before. This would simply extend the existing arrangement between CP Coast (milepost 44.7) and CP Lick (milepost 51.6), where the Caltrain owns the right of way and dispatches the track, southwards to CP Coyote (milepost 59.9). Another challenge is institutional, with VTA having a vested interest in making commuters use the Santa Teresa branch of its light rail network. The Caltrain San Jose extension would parallel this line, possibly cannibalizing some of its ridership. disconnected, as they are today. 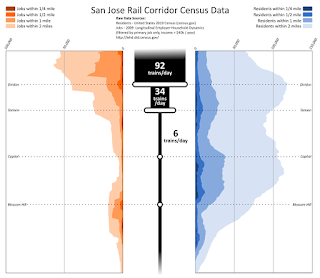 Demographically, the southern half of San Jose is a rich but poorly tapped source of commuter ridership, with dense residential neighborhoods surrounding the corridor. More than 100,000 people live within two miles of the Tamien and Capitol stops, and 75,000 people live within two miles of the Blossom Hill stop. Census data argues strongly for locating the Caltrain terminus at Blossom Hill, with an electrified train storage yard / layover facility in this large vacant space [UPDATE: that large vacant space seems to be spoken for, so look for other unbuilt spaces in map at left], a far better place to park out of service trains than in the middle of San Jose Diridon. ACE and Amtrak trains could be turned at the existing Tamien layover facility. Turning all Caltrain service at Blossom Hill would improve service for hundreds of thousands of San Jose residents and workers, at some increase in capital cost (to electrify) and operating cost (12 minute longer runs). On the other hand, it would greatly reduce Caltrain's requirement for tracks and platforms at Diridon station. Caltrain would operate through the San Jose Diridon station much like it does at the Palo Alto University Avenue station, using just two tracks and two platform faces. If that seems hard to imagine, remember that Palo Alto has almost 60% more ridership than San Jose Diridon; any perceived need for all those tracks and platforms at Diridon, and the profoundly mistaken notion of a "South Terminal", arises from existing jurisdictional boundaries and Caltrain's unhealthy habit of parking trains in the worst possible place to park trains. 2) Build high-speed rail at grade. 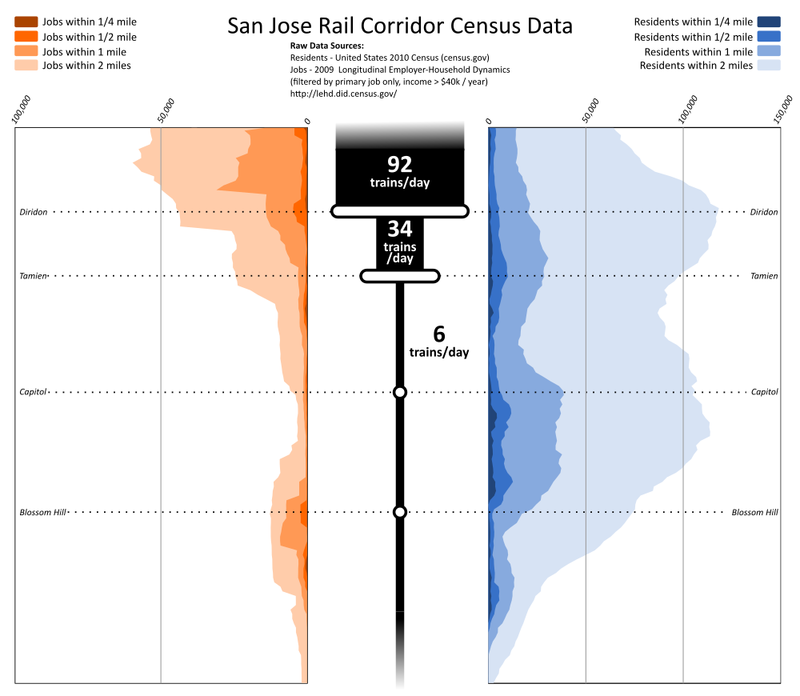 With Caltrain's San Jose footprint shrunk to just two platform faces, and with HSR's recent decision to shrink platform length to just 800 feet, it becomes feasible to operate the San Jose HSR service entirely within the existing at-grade footprint of the station, without the need for expensive new elevated or tunneled infrastructure. Two of the existing platforms are already over 1200 feet long and could be converted for HSR use. Just as in San Francisco Transbay, these platforms could be shared with Caltrain, taking advantage of Caltrain's new dual-boarding-height trains and leading to even more efficient utilization of the existing station footprint. Operationally, HSR would have to quit the same nasty habit of parking trains in the worst possible place to park trains. Trains would have to layover somewhere north of Diridon, or continue onto the peninsula rail corridor. There is no operational need for longer station dwell times than two or three minutes within the Diridon complex: get in, board and/or alight passengers, and most promptly and importantly, get out. Go layover somewhere else than the bustling city center. Building everything at-grade would save about a billion dollars (by foregoing about $250M for elevated approach tracks, $500M for the elevated Diridon station complex itself, and $500M for the "iconic" but entirely avoidable viaduct to cross the 87/280 freeway interchange to the south). An added benefit of the at-grade approach to San Jose is higher speeds and lower trip times. 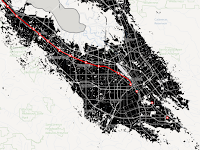 The extremely tight 1000-foot curve radius that connects Diridon to an "iconic" viaduct saps the 'H' out of HSR by limiting trains to just 50 mph, while the existing curve through the Gardner neighborhood could be grade separated and operated at 65 mph. Rather than cower in the shadow of a new "iconic" bridge proclaiming loudly that they are just a flyover neighborhood, residents of San Jose's Gardner district would gain a grade separation at Virginia Street, improving neighborhood access that has been so brutally cut off by the I-280 and SR-87 freeways, and eliminating the sound of railroad horns--even freight train horns. 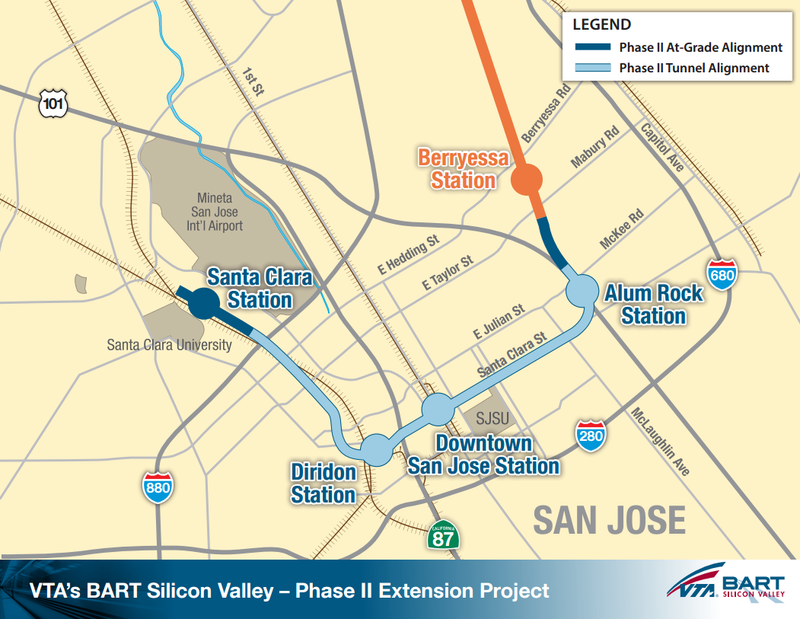 As planned by VTA, the BART to San Jose Phase II project doesn't just take BART to San Jose, but takes BART beyond the San Jose Diridon/Arena station, veering north to parallel the Caltrain / HSR corridor for a redundant 2.5 miles, ending in Santa Clara. While this configuration might have made sense long ago when BART harbored ambitions to "ring the Bay" by linking Millbrae and Santa Clara, the present state of affairs argues for a different solution. From a transportation perspective, it makes no sense to spend ~$1.5 billion of scarce transit dollars (pro-rated from the $6 billion cost of the entire Phase II project) on a 9000-foot tunnel leading to a huge Santa Clara station complex just to provide a third way to ride between San Jose Diridon and Santa Clara, two locations already well-linked by Caltrain and VTA's 522 express bus. The main argument against truncating the BART extension revolves around a new 69-acre maintenance facility planned at Newhall Yard in Santa Clara. BART argues that Santa Clara and downtown San Jose are too far away from the nearest existing maintenance and storage facility, BART's main Hayward Maintenance Complex, to be operated efficiently. The HMC is about 21 miles from Santa Clara, requiring long non-revenue runs to stage trains to/from the end of the San Jose extension. While this is admittedly an operationally inefficient arrangement, BART appears to have no qualms operating Phase I (to Berryessa) out of the HMC, over a distance of 14 miles. Cutting back the 2.5 miles from Diridon/Arena to Santa Clara would place the end of the line less than 19 miles from HMC, not so much further from the HMC than Berryessa already is. The HMC itself is undergoing a major expansion, with storage space for an additional 250 BART cars environmentally cleared based on a purpose and need statement that invokes servicing the BART to San Jose extension. 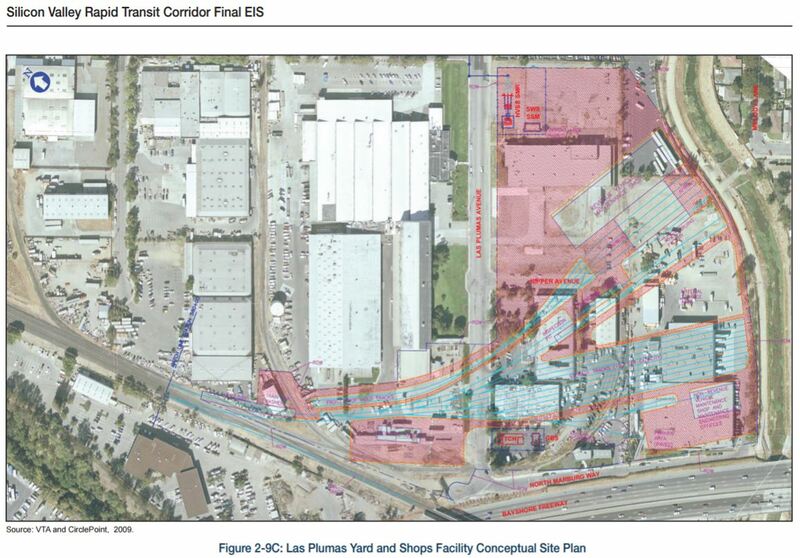 Even then, if the HMC Phase II expansion were to prove insufficient and if maintenance and storage demands were truly that dire, a small portion of the $1.5 billion cost avoidance of truncating Santa Clara could be reinvested to provide a new BART maintenance shop at Las Plumas Avenue, an alternative that was considered during the environmental process. Trains could also be stored overnight at Diridon/Arena, to avoid long non-revenue runs at the start and end of the day. The bottom line: the argument that a Newhall shop is a non-negotiable, vital component of the BART to Silicon Valley project is technically unfounded and rests on a stay-the-course-at-all-costs logic that fails to appreciate the opportunity costs of blowing $1.5 billion on a train parking lot. Another argument against truncating the BART extension concerns a planned airport people mover that would link Santa Clara to the SJC terminals, tunneling under the runways. Using a small portion of the $1.5 billion savings of ending BART at Diridon/Arena, the people mover could run straight to Diridon station, without the need for tunneling under the runways, and connect not just with Caltrain and BART but directly with high-speed rail--seamlessly merging the airport and the train station. As it turns out, there is a better use for Newhall Yard than BART storage and maintenance, namely, HSR storage and maintenance. As previously mentioned, long non-revenue runs to stage trains to/from their terminus are operationally inefficient, but BART can get by because nobody else uses their tracks. If the HSR storage and maintenance yard were to be located in Brisbane, these non-revenue runs would consume scarce and valuable operating slots on the extremely constrained peninsula corridor "blended system," further compromising service quality for all rail passengers. A better plan is to have only a small storage / layover yard in Brisbane, with a larger facility perfectly located just north of San Jose Diridon at Newhall Yard, which would allow a portion of the HSR service to originate / terminate in San Jose without gumming up the peninsula rail corridor. Recall the blended system will be limited to 4 trains per hour per direction unless long stretches of the peninsula corridor are expanded to four tracks, an idea that faces twin obstacles of funding and community opposition. In Germanic countries, there is a guiding principle in rail system design known as Organisation vor Elektronik vor Beton, or roughly, organization before systems before concrete. It gives the order of priorities for quickly and affordably increasing train traffic: first you re-plan your operations, and if that doesn't cut it you improve your technology, for example by using shorter signal blocks, and only as a last resort do you pour concrete. What is about to happen in San Jose is the exact opposite: legions of consultants primarily from a civil engineering background are (surprise!) recommending a concrete-intensive solution to a problem that is ill-posed because it hasn't first been attacked from the standpoint of re-planning train operations. The entire edifice is built on the nasty habit of parking trains in the worst possible place you could think of to park trains. Thinking of San Jose as a terminal is misleading. The litmus test is really simple: if your timetable, operating plan or simulation has any train spending more than two minutes dwelling at a platform in the San Jose Diridon station, then it is probably flawed. Don't turn trains at the choke point of your system, so that we don't spend billions on fancy train parking with zero value to the traveling public and negative value to the taxpayer. The Bay Area can ill afford transit mega-projects of low utility, such as the redundant BART segment beyond Diridon/Arena to Santa Clara, the giant HSR station in the sky, or more downtown train parking. The cost is outrageous, and the opportunity cost is shameful. UP will start looking for a new short line freight service provider. Caltrain will ensure that Caltrain rolling stock can operate on UP's freight PTC equipped Gilroy branch, or cease operating on the Gilroy branch. Caltrain agrees to never electrify UP's Main Track 1 from CP Coast (Santa Clara) through San Jose to CP Lick (south of Tamien), the land under which Caltrain owns. UP agrees not to object to the CPUC safety requirements (1.4 MB PDF) formally adopted on 10 November 2016 for Caltrain's electrification project. UP allows Caltrain's SSF station reconfiguration project to proceed, trading some old yard tracks and a loading dock for $2 million plus a new Caltrain-funded freight yard track at Newhall in Santa Clara. UP settles some old claims by Caltrain for track maintenance. UP will select a Short Line and obtain Caltrain's approval. Caltrain will sign a new trackage rights agreement with the short line. Caltrain will sign a new trackage rights agreement with UP that replaces the current trackage rights agreement, concerning the "South Terminal Area" around San Jose. The Surface Transportation Board will hopefully approve the whole deal, which is the entry criterion into phase 3. Caltrain will own the "common carrier" obligations and be on the hook legally and financially for abandonment of freight service, should that ever be contemplated. The Short Line will own the common carrier obligations on the sidings and lead tracks not owned by Caltrain. UP will transfer to Caltrain the rights for intercity passenger service north of CP Coast in Santa Clara, but not south of there. UP will agree not to pursue legal action against the electrification project. This agreement could open a tiny sliver of hope for building grade separations that are both cheaper and more community-friendly without stubborn opposition from UP. On the other hand, it gives no hope for relief from freight PTC interoperability, justifying additional costs that have not already been sunk in the bottomless pit that is CBOSS.